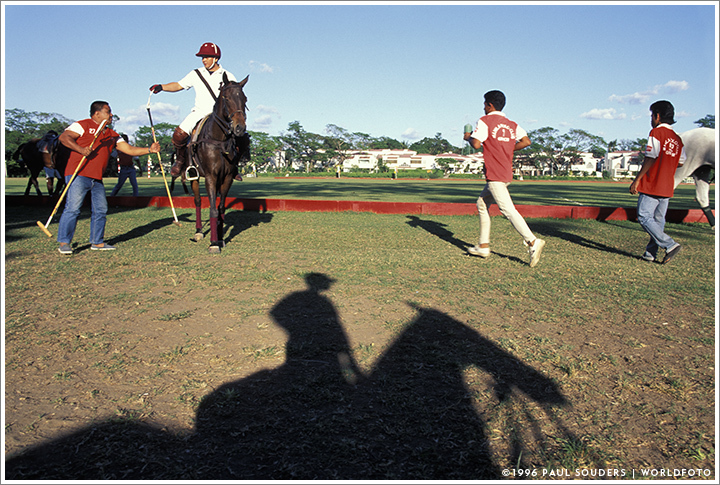 Grooms scurry in to help a polo player between chukkers during a match at the Manila Polo Club in the city’s exclusive Forbes Park neighborhood. Photographed February 6, 1996 with a Nikon F3 camera and 28mm f/1.4 lens on Fujichrome slide film. This entry was posted on Tuesday, February 6th, 1996 at 7:28 am. It is filed under On the Road and tagged with Asia, Manila, Philippines, Polo, Sports. You can follow any responses to this entry through the RSS 2.0 feed.